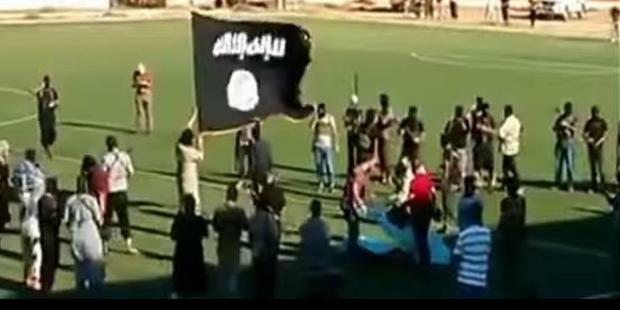 A shocking video has revealed the public execution of an Egyptian at the hands of armed militants waving the black banner in a Libyan football stadium. The public execution occurred in the Libyan town of Derna, located along the Mediterranean Sea and controlled by the extremist Islamic Youth Shura Council. Militants of the Islamic Youth Shura Council, a radical group often linked to Al-Qaeda, posted the video of the Egyptian victim, Mohamed Ahmed Mohamed, being forced to kneel before being shot in the head. A statement read out prior to the public execution accuses him of admitting to the murder of a Libyan national, Khalid al-Dirsi. A man believed to be the brother of al-Dirsi was shown on the video shooting Mohamed Ahmed Mohamed amid applause from the audience. According to Amnesty International, the public execution occurred on the 19th of August. Amnesty International added that there has been no police or army presence in Derna since 2011. Egypt recently evacuated thousands of Egyptians from the conflict-torn Libya, following the killing of multiple Egyptian nationals.